Hold your free hand out palm up, and set the ball on your palm. The ball must remain visible at all times. Toss the ball upward (without spinning it) to a distance of at least 16cm. Strike the ball while it is in the air so that it hits your court first, and then bounces over the net onto the other player's side of the table. In doubles, serve in the same manner, except that you must serve the ball from the right half of your court into the right half of the receiver's court. The receiver's return is good if they hit it over the net back to the server's side, it does not bounce on their side of the table prior to returning the service, and also does not bounce more than once on their side of the table. A let is basically a do-over. No points are scored if the rally is a let. The following conditions trigger a let: If the ball touches the net on the first serve in a rally, it is a let if it is otherwise good, or if the ball is obstructed by the receiver or his partner. If there is a disturbance that is out of the control of the players, it may also be considered a let. If a server does not comply with serving rules, it will be considered a let, and finally, in instances where the umpire stops a rally, it is considered a let. In rallys that are not lets, players score under the following conditions: If the player's opponent fails to make a good service or a good return, a point is scored. If the ball is hit off the table without first bouncing in the court of the player receiving the ball, a point is scored by the receiver. If your opponent obstructs the ball, you score a point. You also score a point if your opponent hits the ball twice successively. A point is scored if your opponent hits the ball with the side of a racket that does not meet regulation requirements, and you score a point if your opponent, or anything they are wearing, moves the playing surface or touches the playing surface with their free hand, or touches the net. In a doubles match, if a player strikes the ball out of sequence, the opposing team scores a point. Players choose who goes first by "lots." For all intents and purposes, a coin flip works just as well. The player who wins the coin flip or chooses the winning lot gets to decide whether they will serve or receive first or which side of the table they want to begin from. After they have made their choice, the other team gets to make the choice for the remaining decision (table side or receive/serve). In a doubles match, the team that goes first also gets to decide who serves first on their team, while the other team decides who on their team will receive first. Play alternates from the server in the right corner hitting to the receiver in the right corner, who hits to the player in the left corner, who then must return to the other team's left corner. Play continues in this pattern, and if any player hits out of turn, the opposing team scores. After two points are scored, the server becomes the receiver. This continues throughout the entire match unless both players or teams have scored 10 points, or the game is shortened through the expedite system, in which case serving and receiving alternates after each point scored. In a doubles match, at each change of service the player who last served becomes the first receiver, and the player who received last becomes the first server. Additionally, when a match changes, the team that received previously becomes the serving team, and both teams switch sides. In the event of errors of order or sides, the umpire will stop the round when they notice the error, and players will assume their correct positions. Points scored before the error was noticed still stand. The game is decided when a player reaches 11 unless both players have a score of at least 10, in which case, the game must be won by 2 points. A match will be decided by the best of any odd number of games (3,5,7,9 etc.). In games where both players have not scored at least 9 points after 10 minutes, the expedite system is enforced. If the ball is in play while the time limit is reached, the umpire will interrupt play to begin the expedite system. Players now alternate serving after every point scored, and if any successful rally reaches 13 returns by the receiving player or team, the receiving player or team scores a point. The balls, table and net must meet specific guidelines to fulfill tournament standards. The ball must weigh 2.7 grams and be a sphere with a diameter of 40mm. It must be composed of celluloid or a similar plastic, must be white or orange, and it needs a matte finish (non-glossy). The top of the net must be 15.25 cm above the table. The bottom of the net should be as close to the table as possible. Additionally, the net is to be secured to the table with two supporting posts that are clamped to the table. The outer limits of the posts need to be 15.25 cm away from the side line. The playing surface needs to be rectangula, with a measurement of 2.74 meters long and 1.525 meters wide. 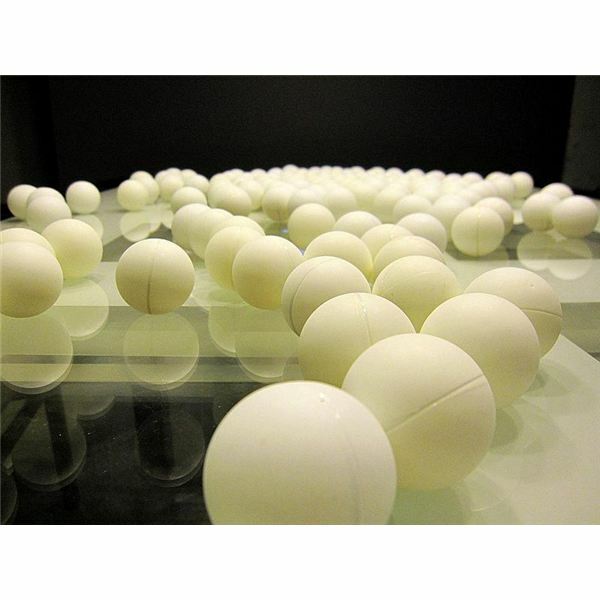 The surface of the table may be made from any materia, as long as it produces a uniform bounce of 23cm when a ping pong ball is dropped onto it from a height of 30cm. Additionally, the surface must be uniformly dark-colored with a matte finish. White side lines 2cm in width must be painted along the edge of the table, and 2cm white end lines must be added to the ends of the table. An additional line 3mm wide should divide each court for doubles play, with the net dividing both halves of the court equally. Table tennis paddles must meet certain criterion to satisfy the official International Table Tennis Federation (ITTF) rules. 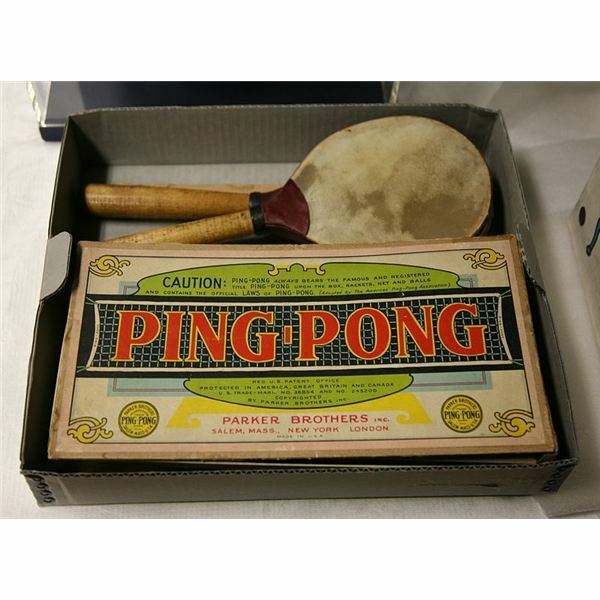 Since you probably won't be assembling your own racket, simply shop for a paddle that meets the requirements set forth by the ITTF. If you ever did want to make a custom paddle, you'd be in for quite the endeavor. For starters, the paddles must be 85 percent natural wood, with an adhesive reinforcement allowed, as long as it doesn't exceed 7.5 percent of the total thickness of the blade or .35mm. The striking side of the paddle needs to be covered with pimpled rubber or sandwich rubber, which is a combination of pimpled rubber and cellular rubber. These rules continue, with specifications for even the color of the paddles as well as boundaries of the rubber adhesive. Expect your opponent of using a bogus racket? If they change rackets in a match, they must present it to the umpire prior to use, and you have a right to inspect it.